We are interested in the evolution and assembly of photosynthetic apparatus in plants. 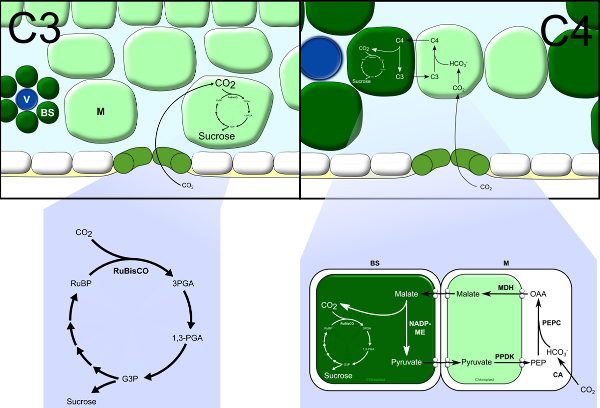 In particular, we focus on the C4 leaf, where photosynthesis is compartmented between mesophyll and bundle sheath cells. C4 leaves have higher photosynthetic capacities than those of C3 species, and as a consequence, C4 crops are the most productive on the planet. Because C4 plants use the PEPC enzyme to initially fix carbon, and it has a higher affinity for carbon than RuBisCO, these species maintain lower stomatal conductances. Furthermore, as RuBisCO only accumulates in BS cells, each leaf has less RuBisCO protein. Together this leads to C4 plants having superior nitrogen and water use efficiencies than C3 species. They are therefore targets for future food and fuel needs. The C3 and C4 biochemical pathways. In collaboration with the International Rice Research Institute in the Philippines, and other partners we are members of an international consortium that aims to intiate work on this Grand Challenge. In addition to the collaborative work on C4 rice, we also have strong collaborations with a number of other groups around the world. We are also currently using pairs of phylogenetically close species (rice and maize, and Arabidopsis and Cleome), to gain mechanistic insight into how the C4 pathway operates, and also how it evolved. Maize and rice are useful models as crop species, while Cleome is useful because of its relatedness to Arabidopsis. development and use of computational tools for analysing rich datasets. The work that the laboratory has undertaken has been recognised in various ways, including the Melvin Calvin award for research in photosynthesis. This international award is presented once every three years to recognise a substantial contribution to understanding photosynthesis. The specific aims of placing characteristics of C4 photosynthesis into rice has been recognised by Nature, - see the orignal article and commentaries at Cambridge Network and BBSRC.